One of the trickiest questions product people ask themselves is: how can I innovate on my product while being in a constant delivery mode? Every product person gets to that question sooner or later. Usually, it happens with more or less mature products in big companies. Where a large group of stakeholders fights for pushing their requirements in. Roadmaps have been created for years ahead and technical debt keeps on growing. At that time product backlog is usually consists of hundreds of stories, some of which created a couple of years ago. Product owner of such backlog has her "hat on fire"(which we always have), running around stakeholders to reach some kind of consensus and sense of priority. She already forgot about all those great features she wanted to try out. There is no time to innovate when you run from one fire to another. Is there a better way? How come some companies are able to innovate while continuously delivering their products? There is a better way and it's called Dual-track product development. SVPG popularized that concept in product management community a while ago. It describes a way to combine two vital processes in product development: product discovery and product delivery. By following dual-track product development company could discover a product that is valuable, usable and feasible. Then it could deliver it effectively. The concept of cross-functional product teams should not be alien to anyone. Cross-functional product team consists of members with the different expertise needed to deliver the right product effectively to a market. The key to a cross-functional team is rather simple: it should be able to perform the entire circle of product development. From an idea to a post-release support. Such team should be responsible for a product fully and not be dependent on anybody else in their work. The biggest challenge for the cross-functional team is: how to combine product discovery and product delivery? Most teams I've seen been optimized for delivery. Partly because those teams originated from an IT department and tech always tend to optimize for delivery. When the product gets involved with an ambitious challenge to increase a value of a product - a set of problems appears. To overcome those challenges team needs a formal dual-track development process. To effectively do dual-track PD split your backlog in two: discovery backlog and delivery backlog. Discovery backlog should consist of ideas and concepts for further validation. While delivery backlog should include only the items ready to be coded and released. Tip to try out: keep a story in a discovery backlog until it's fully defined, including UX, design, and copy. So then when a story gets to a delivery backlog developers could start implementation right away. In this track, you need to prioritize, validate and decide upon product ideas. Here is your usual development process with user stories, sprints, reviews, and releases. 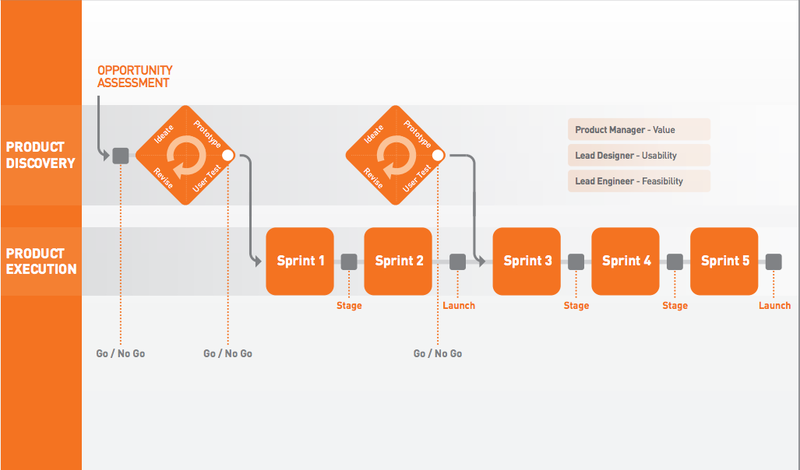 Both product discovery and delivery could be and should be performed by the same team. You not necessary need the entire team to do product discovery ( a minimal set is: developer, UX, nd PO) but it's always better to keep everybody in the loop. It builds the shared understanding of user problems, market and business you're in. You can either combine discovery and delivery within one sprint or split them in the independent sprints. No matter what way with your sprints you'd choose it's a good practice to have the entire team and key stakeholders on the review meeting(s) for discovery and delivery sprints. It is vital to present the findings of a discovery work and therefore prepare the team and the stakeholders on what will come in the future. Ideas from the discovery backlog that been validated should be moved to a delivery backlog. There is a way for product teams to effectively combine product discovery and product delivery. 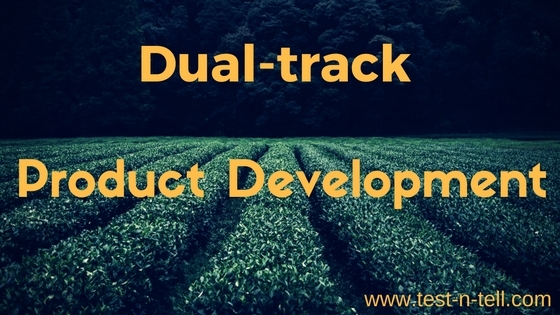 Dual-track product development concept could be easily adjusted to your company situation and team setup. By following dual-track PD cross-functional product team could reach peak performance in creating valuable products.